The Castle Dargan Hotel, Sligo's leading Golf Hotel & Wellness Resort, located on the historic Castle Dargan Estate just outside Sligo and featuring Four Star Luxury Hotel Accommodation, Icon Spa & Wellness Centre plus our Darren Clarke designed 18 Hole Championship Golf Course. Located a short ten minute drive from Sligo City Centre, just off the main N4 Sligo to Dublin road. Travelling from Sligo Town Proceed to the Carraroe Roundabout and onto the N4 Route in the Direction of Dublin and Galway. At the Colloney Roundabout take the R284 exit and Follow Signs to Ballygawley.Castle Dargan is Nearby Ballygawley on the Dromahair Road. There is much to see and do in the surrounding areas but with such fabulous facilities at the hotel you may never get the chance. However, there are many local walking trails that you can enjoy. Got a Walled Garden Apartment for €59 a night. Stayed with my husband, my 1 and 3 year old. I can't complain for the price but 2 additions to the apartment would have been ideal and made our stay complete: 1. a microwave. 2. A TV with HDMI port or failing that, a DVD player (parents who go for these apartments and have put the babas down to sleep, will want more than just 3-4 tv channels for their entertainment). We like the hotel - this was our second stay. The one thing we did not like was the duvet on the bed - it felt like it weighed a ton! In fairness, this, unfortunately, seems to have become the norm in many hotels now. 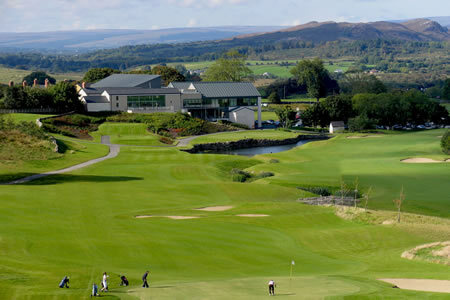 I really liked Castle Dargan, I dont play golf but there are plenty of sites to see in Sligo, The food was very good and the rooms have their own mini kitchen. I would book this place again. I really liked the bedroom which was spacious. The staff were friendly and helpful. I will return!!! We had a lovely stay at Castle Dargan. Perfect for a relaxing break.Lovely clean and comfortable hotel. Excellant Breakfast and Bar food. Friendly staff. We weren't golfers, but wished we were to have a go on the wonderful golf course. Very pleasant stay at Castle Dargan, beautiful surroundings, clean and modern rooms. Bar/grill lacked atmosphere on a minor note. Castle Dargan does not deliver what it promises - with 3 exceptions, staff are cold and impersonal. Welcome pack is at odds with the chef. Breakfast as per brochure does not match with kitchen staff - no pancakes. Golf Pro very friendly and helpful - shame about the course - grass growing in bunkers, fairways not cut. Won't be rushing back or giving a positive report to friends. The Hotel was very welcoming and the staff friendly. The Hotel is surrounded by lovely views. Our bedroom was a good size and very comfortable.The food was excellent. The Hotel bar was not very appealing. It seemed to be situated in a long room which gave the appearance of a corridor and had some seating at one end which made one think of a cafeteria. The decor was very bland. The management should re-think the layout of the public areas. One other diappointment was that the facilities (sauna etc.) were only available to Hotel guests on the payment of %u20AC20 each. I have never been asked to pay, for such facilities, in a 4* hotel before. We really enjoyed our stay at Castle Dargan. It is set in a peaceful location outside sligo town. There is loads to do like strandhill, Rosses point near by. We were very impressed with the food and service in the hotel. Members of staff always spoke to me by first name so they made a good effort. The Spa is exceptional with facilities being one of the best i ever seen and i have done a lot o travelling. The only thing which is a little off putting is the bar as it was too qiuet and could do with trying to put on some form of entertainment for guests. otherwise very impressed. We enjoyed our stay @ Castle Dargan, but we where disappointed that there was no swimming pool. The hotel and grounds were lovely. The hotel itself is clean, tidy and modern. The golf course, although I did not play, was busy and those who did play seemed to enjoy the young course. The staff were very helpful and pleasant. The hotel and its staff were lovely. The location was very scenic and really close to Sligo town. I found the Castle Dargan hotel to be very good. The food, accommodation and service all great. Couldn't fault it. The hotel was a great location to explore Sligo. We would love to stay here again.